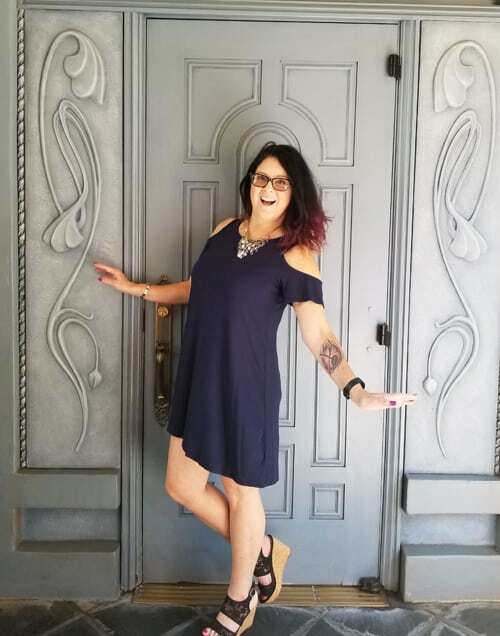 You are here: Home / Cool Things / Starting the Curly Girl Method: So Far, So Good! Starting the Curly Girl Method: So Far, So Good! Have you considered starting the Curly Girl method of bringing your natural waves and curls to life? Read on for my experience! I was blessed with a crazy thick mop of hair that is frequently out of control. If I want to do anything with it, I have to wrangle it into submission with a flat iron or a curling iron. Otherwise, it’s all over the place — some is straight, some is straight-ish and there are inconsistent waves in weird places. Rarely does it all come together into one style without some work. To make matters worse, I have been dying my hair since I was about 16. 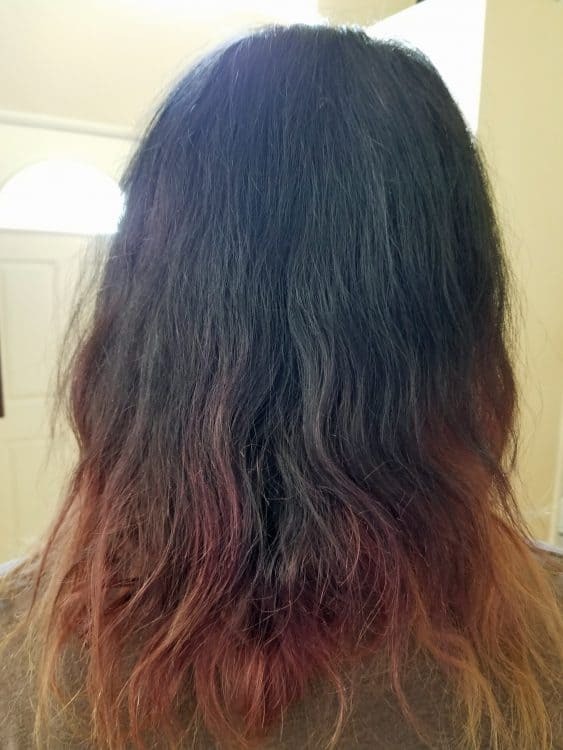 I’ve had it all shades of red, black, purple, blue, pink and one time, even tried blonde highlights. My favorite is black with purple about 2/3 of the way down. My real color…I haven’t seen it in so long, I’m not sure what it would be now, though I did start getting grey roots a few years back. Kinda early, in my opinion, but that’s just one of the many things in life we don’t get a say in. It used to be a dark brown auburn. I loved it but I loved experimenting with colors more. Now I’m paying the price, with dry hair that kind of just hangs there, sticking out some and not ever really looking “good” without a lot of work. Even then, it’s frizzy and easily looks raggedy. It’s time for a change. I started researching deep conditioning, defrizzing products, you name it, and came upon the Curly Girl method in a lot of search results. After really reading about it more, or getting the Curly Girl: The Handbook book by Lorraine Massey , I decided to give it a shot. Its basis is simple: stop putting harmful products on your hair, stop weighing it down and damaging it further with heat and encourage it to let your natural curl return with better treatment overall. That sounds pretty simple, right? Starting the Curly Girl method IS simple. I used a clarifying shampoo, then used an appropriate conditioner and let it air dry, scrunching it repeatedly, putting away my brushes to use only wide-tooth combs IF I can’t detangle it with my fingers, and using a non-sulfate gel. I’m on day three now. It’s too early to tell how successful it will be with my hair type (2A to 2B, depending on the day and weather) but I’ve had two random comments on how my hair is wavier and flatter than normal. Flatter may not sound like a compliment, but for me, it is. My hair was so dry, it would stand up too much, poking out to the side and not laying against my neck or back. It isn’t pretty. My hair feels better, it’s softer, it’s more controlled AND it smells good. I will co-wash it tonight (washing without shampoo, using just a smidge of safe conditioner at my roots) and use my conditioner again, then use some gel to scrunch up the curls. I did forego the cut — it hasn’t been long since I had a trim and one problem my hair does not have is split ends. It is barely growing anymore so I’m trying to avoid having shorter hair. There are a lot of websites you can google to learn more about it, but here’s a link to the book — it is an affiliate link, fyi, as are all the links to the products below — and it’s also available via Kindle Unlimited, which is what I used. The only thing I did wrong so far is that I didn’t order a satin bonnet first. Mine will be here on Tuesday — I know my restless sleeping is hurting my hair and flattening the curls. Plan ahead! I’ll update with an after picture later. Here’s my Day #3 photo — I’m overdue for new purple-ing, which I know will not help my hair but it’s the one thing I’m not changing. I neglected a Day #1 photo, we were running crazy getting the son ready for his Homecoming dance last night, but suffice it to say it was raggedy, frizzy, wouldn’t lay this flat and was lacking shine. Already, improvements! Here are the products I purchased. I got them all on Amazon, and including the bonnet, I probably spent about $42. The products will last a while and I hope to not replace the bonnet for a long time. The Suave Daily Clarifying Shampoo was inexpensive — there are a lot of options but I trust this product. The Tea Tree Tingle shampoo is available at Trader Joe’s, where I happen to shop weekly, but I ordered it on Amazon to have it available the same day as the rest of the products without making an extra trip. (Lazy.) The MopTop Daily Conditioner smells SO good, I love this! And the Fruit of the Earth aloe vera gel? Seriously, I know it doesn’t say hair gel on it but it works! I’ve shared links to all of those products above in case you want to try them out for yourself. 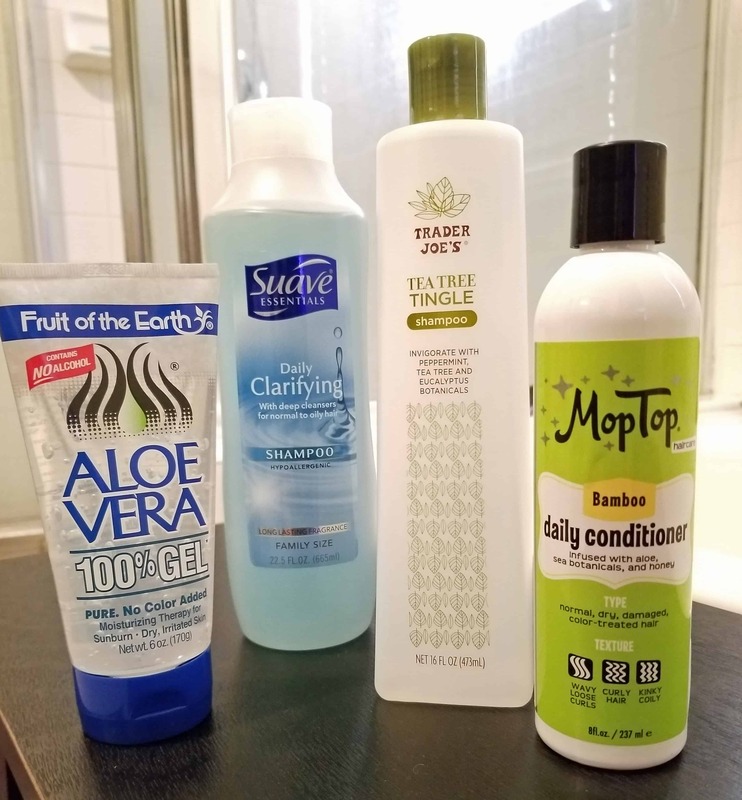 I didn’t skimp on cost because I want my hair to look good, but none of these products cost a lot either, so it’s a matter of personal preference as the book and the many websites that explain it all do offer options. You can buy bigger sizes of all of those, or multi-packs, but my recommendation is to buy the regular or smaller sizes that give you long enough to see if you like them but without committing a lot of money if you don’t. I’ll update at the end of 30 days, but if I have a particularly fab day of curls or waves, I may share on social. My hair is so dry, I really don’t expect immediate success but I do believe that in starting the Curly Girl method, I am making a change for the better!